How much air drumming can one Englishman take in 12 minutes? 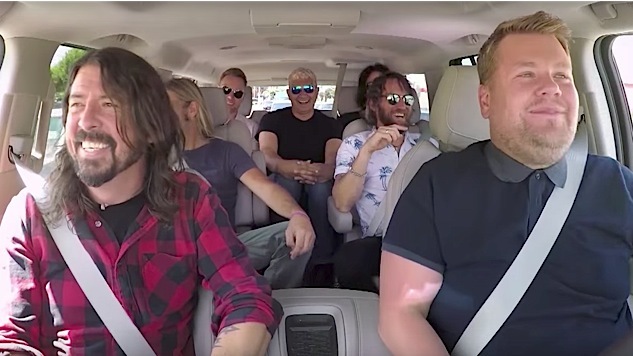 Of course Dave Grohl would kick off Foo Fighters’ episode of “Carpool Karaoke” like he was warming up a crowd of 25,000 people. As usual, it was just him, his band, and James Corden behind the wheel of an SUV. The next 12 minutes produce more air drumming than can reasonably be expected, or even wanted, in one four-wheel vehicle. Even Grohl, who’s got a perfectly great drummer in Taylor Hawkins, turns to air drums rather than air guitar when the chips are down. Maybe not surprising. The Foos yelp their way through a bunch of hits like “The Best of You,” “Learn to Fly” and “The Sky Is a Neighborhood” (from the new Concrete and Gold) between the usual softball questions from Corden. Watch below, and check out our recent ranking of the 10 Best Foo Fighters Songs here.